I really need to buy another one. I absolutely love this product ???? I have found many uses for this gadget. I have used it on blankets, towels, rugs and many more. This has saved all of my sweaters. Buying one for my mom. I just love it. It's so easy to use. Save your clothes! This gadget is the best. I WORE OUT MY FIRST PILL SHAVER AND HAD TO BUY ME A NEW ONE. Use a rubber band to hold a sandwich bag at the bottom, to keep from emptying waste compartment all of the time. It works. Easy to use, lightweight. I like that it uses AA batteries instead of the large D batteries that others use. Only used it twice so far so we'll see if it holds up come this winter and lots of sweater use.. I have seen other shavers like this one before at a much higher price. I am very happy with this one. Does exactly what I had hoped it would do. Oft time sweaters or certain fabrics will pill and look aged. Using this removes the pills and item looks good again. An inexpensive tool that makes clothing look like new. 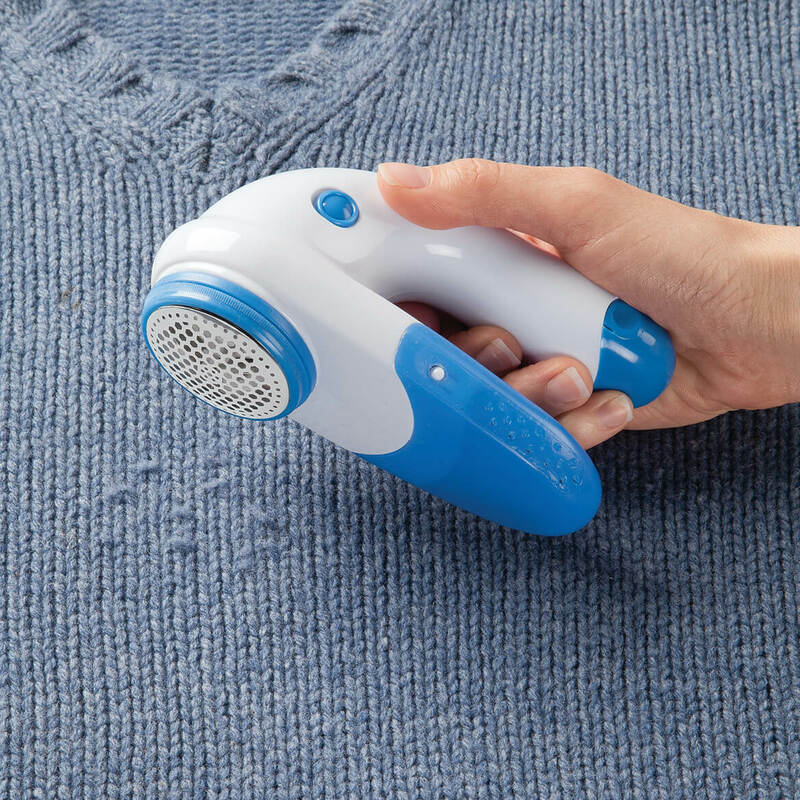 It removes the fuzz & lint on slacks, around the wrists of sweater sleeves & other clothing. I've been using this for years & just bought one for a gift. I cleaned all the little lint balls off of my sweatshirts. They look much better. Yes loved this fabric shaver! Use on all my fabric's! I use these on my sweaters and sweatshirts that pill up sometimes. They do a great job cleaning these items and the shaver is easy to empty. I don't have anything bad to say about them. I crochet afghans and this is the best product for removing fuzz balls and also "thread knots" from sheets. I am ordering one for my daughter in law now. It does the job i wanted done. Used on sweaters to remove the pills off quickly and easily. Very light weight and doesn't damage the garment. It does remove fuzz, but it takes forever to do it. If there is a large area to do, the unit must be emptied frequently. It has a partial cover over the blade part to store it, but it doesn't cover the entire surface so things could still get into the blade mechanism. Great idea (or so I thought). Unfortunately it only ran for about 3 minutes before it died. Checked the batteries and they were fine. Changed batteries anyway and it still doesn't run! Great idea but no instructions were included. never used it fell apart when I put batteries in it poorly made!! I had to tape the cover back on. Fabric Shaver received however put batteries in and the item did not work....Felt i didnt want to pay the postage to return this item....But it will make me to take more of serious decision when ordering in the future.. It looks as if it will do the job and has a handle which I like. I noticed some of my clothes have these tiny things I call fuzz balls and it is embarrassing to me as I feel everyone sees this. I want to be free of this fuzzy balls. Because my wool has a lot of lint balls and I am now using a blade to remove them. 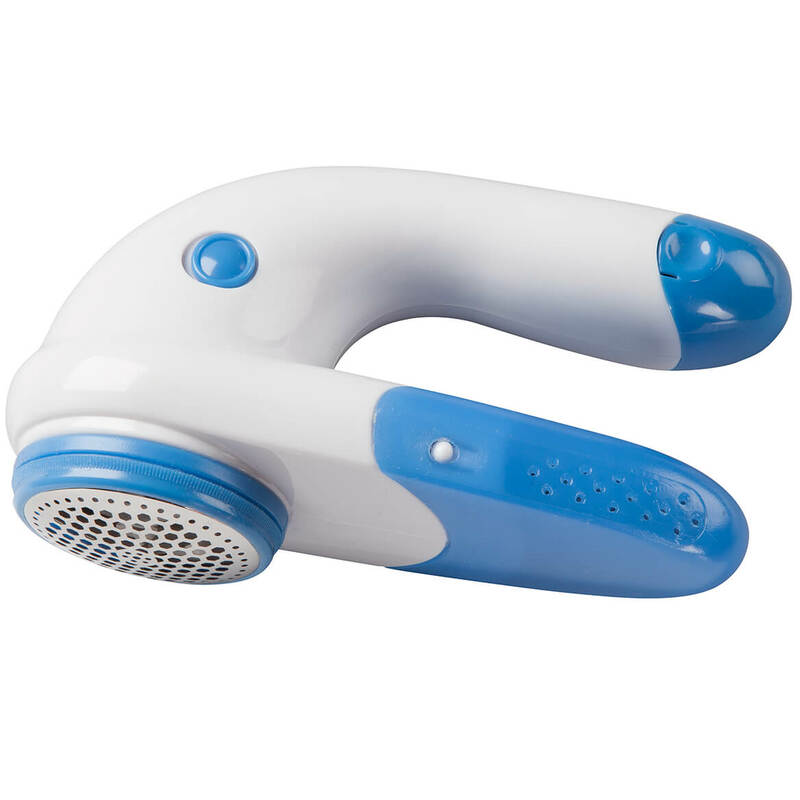 My husband likes these gizmos to take fuzz off his wool socks. I want to see if it will remove the pilling on some of my garments. had one in the past, moved and lost it Love it! my wife circled it in the catalog. Replacement, outlived my last one. Makes sweater look nice again. Works well and some things need de-pilled. To shave fuzz ball off of sweeters. I used the one my mother had ordered and it's much faster than the handheld one that I have. Have had a small clothes shaver for a long time. Needed to replace. Improve appearance of my sweaters. My mother in law gave me when 30 years ago and it finally died. I have had one with a much smaller opening. This will do the job much more efficiently. I liked the one i had for over 20 yrs, that finally died. It is very useful on blankets and sweaters. I am lost with out it for the past 3 wks. Good product. Useful, economic, practical, makes fabric new again. IT is for good use, a permenant lint brush. Good for sweaters. My clothes have little fuzzy backs on them. I lost mine in a house fire and it removes pilling on tops with ease. I needed this item and it was on sale. because i have a sweatshirt that is full of fuzz. Hope this remove it. They work great on sweaters an jeans.that have fuzz on them. To get the fuzzies off my winter sweaters! Convenience! No more brushing and brushing with no satisfactory result! It's size. Have old, very small one but now that I have carpal tunnel in both hands, need a nice handle to hold. To use on new couch. I purchased this product because some of my dark color clothing has fuss ball on it. I really like the items, hoping this will help. Bought one for my daughter and one for me. I picked the hammock for the beach and the shaver for pills on sofa cushions. I have lots of fleece tops that continue to have fuzz balls on them and I am embarrassed to wear them. I hope this fabric shaver does the trick so I can continue to keep them nice looking. Needed to remove that lint and fuzz on clothes,etc. BEST ANSWER: Thank you for your question. The front blue part comes off to empty.We hope this information will be of help to you. has a plastic cover that catches the clippings then pull off the plastic cover and empty.